Hello, lovelies! I've been falling to the white crisp shirt and white cover up lately. Whites have always been simple and classy. It is like a blank canvass that you can either pair with a solid color or with a printed one for a quirky look. So, for today's look, I got a top not only it is white but it is so stylish and unique. Just scroll down below to know more details about this style, lovelies! The moment I saw this white loose hollow out tank top with metal rings, I immediately added it to my shopping cart. I really love its design. The hollow-out, metal rings and that tie hanging sleeve are just so stylish to look at. Also, I really find it unique! I am very satisfied with regards to the material; it is smooth and fine to touch. The size is true and putting it on is not complicated at all. Overall, this is a must-have piece in your closet for times you want to wear something unique. I'm telling that this is a real eyecatcher. I also love that this is in plain white, so matching it with printed bottoms will definitely make your outfit stand out. Get yours as soon as possible as there are only a few stocks left. 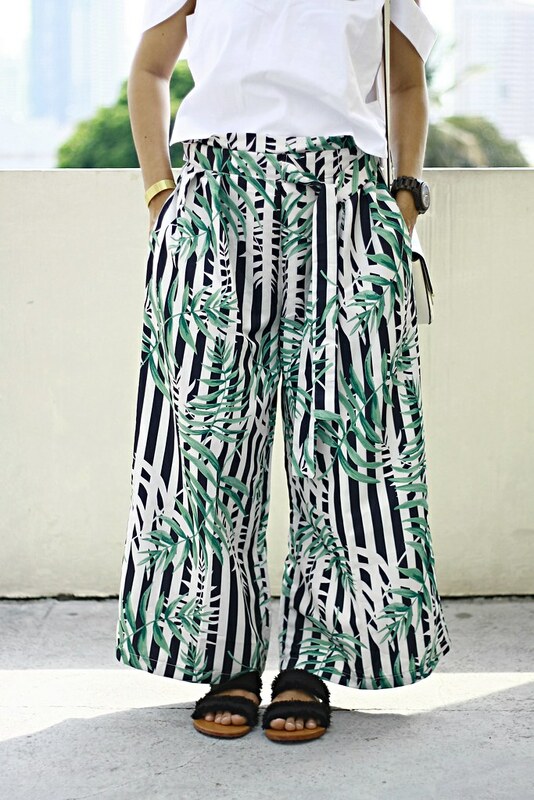 This stripes bamboo leaves print wide leg pants was perfect to pair with the white top. Yes, I ordered this pants together with the top at the same time. Isn't it perfect? This has a wide elastic waistband at the back and there's a tie design at the front. It has two side pockets, too. It is high-waisted and the length is actually above my ankles but I opted to pull down the waistband a little bit lower because I much preferred length below my ankles when it comes to wide leg pants. The size particularly the waistline is a bit bigger than usual or maybe I've just lost another inch, so that gives the room for me to settle the waistband in my mid-waist. The material is very good, too. Overall, this is a worthy buy.